Almost all grains, dry legumes (pulses), and oilseed crops are annual crops, or “annuals”. Annuals are planted from seed, grow to maturity, produce seed or fruit and then die, all in one year. Today, annual crops account for roughly 85% of the human population’s food calories and the vast majority of planted croplands worldwide. To successfully grow annuals, farmers have to suppress or kill the vegetation (weeds) that compete with crops for sunlight, nutrients, and water, especially when the crops are seedlings. Over millennia, farmers traditionally used implements such as hoes and plows to eliminate vegetation from the landscape before sowing annuals. This soil disturbance has caused significant amounts of soil carbon loss (which ends up in the atmosphere as CO2), soil erosion, nutrient leakage, and changes in soil organisms. Recently some farmers in the developed world have replaced reliance on tillage with chemical herbicides. This shift to “no till” cropping reduces erosion and tends to improve soil organic matter, but can still result in nutrient leakage, low soil organic carbon levels, and reliance on fossil fuel based inputs that carry possible health risks. Annual wheat on the left, and Kernza® on the right. A cousin of annual wheat, Kernza® is a domesticated perennial grain originating from a forage grass called intermediate wheatgrass (Thinopyrum intermedium). Kernza® is in the early stages of commercialization. A plant in the sunflower family native to the Great Plains and other parts of North America, Silphium integrifolium is being domesticated as an oilseed crop that could replace annual oilseed crops such as sunflower and soy. Legume crops were developed to maintain or increase soil fertility through nitrogen additions for subsequent crop species (like cereal grains) while simultaneous providing high protein seeds for human consumption or highly nutritious forage for livestock. We are working to identify potential species to develop as perennial grain and companion crops for other TLI perennial grains. The Global Inventory Project is an ambitious, large-scale, global collaboration between The Land Institute, the Missouri Botanical Garden (one of the world’s largest research botanical gardens), and Saint Louis University to identify perennial species candidates for domestication and use in perennial polycultures in temperate and tropical climates. The second method of breeding new perennial crop species is to cross an existing annual grain crop with a wild perennial cousin. When successful, these “wide hybrid crosses” produce plants that maintain seed yield and quality similar to the annual parent while inheriting the perennial lifestyle from the other parent. 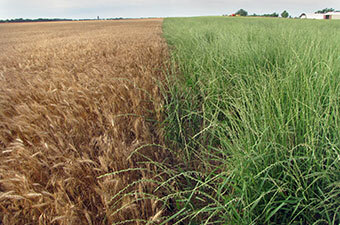 Perennial wheat work at The Land Institute focuses on hybrids made from crossing annual wheat species – especially durum wheat used for making pasta – with wheatgrass species including intermediate wheatgrass (the same species being domesticated as Kernza®). Sorghum is a tropical grass originally domesticated as a crop in sub-Saharan Africa. Like annual sorghum, the perennial hybrids maintain good seed yield, but seed size and flavor require further breeding attention. Land Institute perennial hybrids are being trialed in several sub-Saharan African countries to determine if they can persist through dry seasons. The Land Institute is breeding new perennial grain and seed crops adapted to ecologically intensified polycultures that mimic natural systems in order to produce ample food and reduce or eliminate impacts from the disruptions and dependencies of industrial agriculture.